It’s all about the jump. 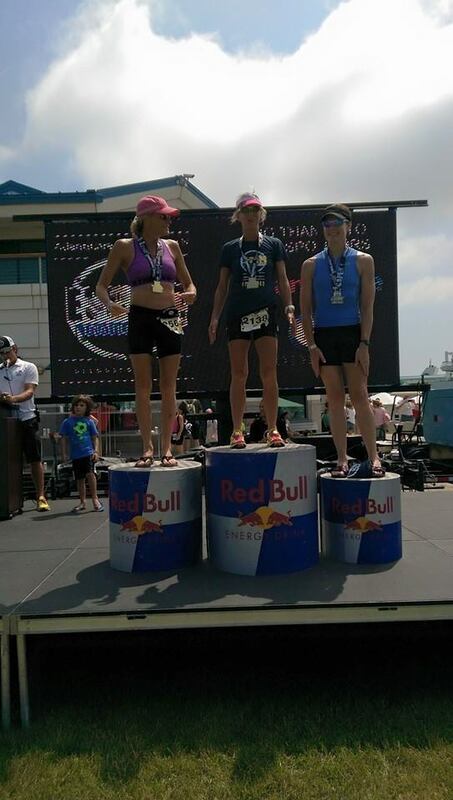 You can talk about the beach run, the sand ladder, the tight bike course, the hot, sunny day or the cold, post-race beer. It makes no matter. This race is all about the jump. 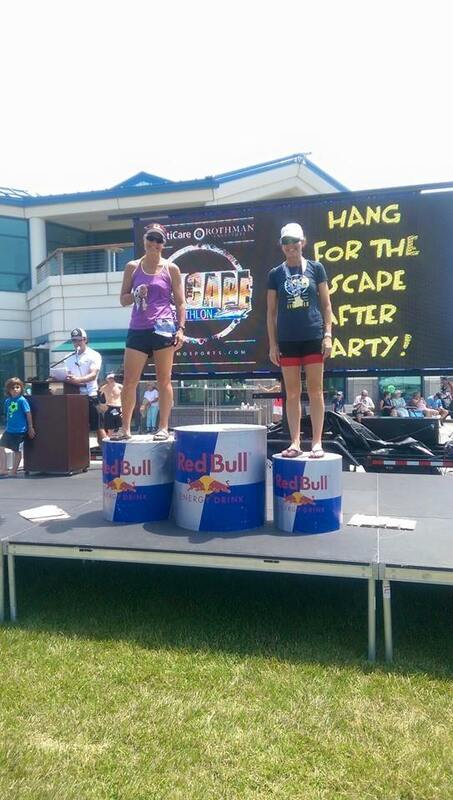 The third annual Escape the Cape Triathlon took place on Sunday, June 14 in Lower Township, NJ. There were two races, an international distance and a sprint distance. Both consist of the jump from the Cape May-Lewes Ferry/swim to shore, a loop bike course, and a flat run that visits the beach several times, just to torture your tired legs. Most of Team WBTU showed up ready to take the plunge. We were missing the Jellybean, Maui Bonnie/aka The Sea Bonster, and Mini Race Director. Mrs. Donovan and Snarky G. raced the longer distance, while the Race Director and the Rev raced the sprint. I also raced the sprint because I didn’t want my death certificate to read Cause of Death: Out of Shape. After a soggy, stormy early morning, we filed onto the Cape May-Lewes Ferry. We had a short weather delay, which allowed me to distribute some 5Q tattoos, and also make some new friends. I met pals Earl from Brookhaven and Mickey from Aston. It was Mickey’s second triathlon and first ever open-water swim. I asked Mickey if he came to triathlon from running or cycling and he said, “Neither. He (Earl) talked me into it. This morning I smoked 8 cigarettes and yesterday drank 10 beers.” I haven’t looked at the results yet, but I really need to know that I beat Mickey. Really, really. 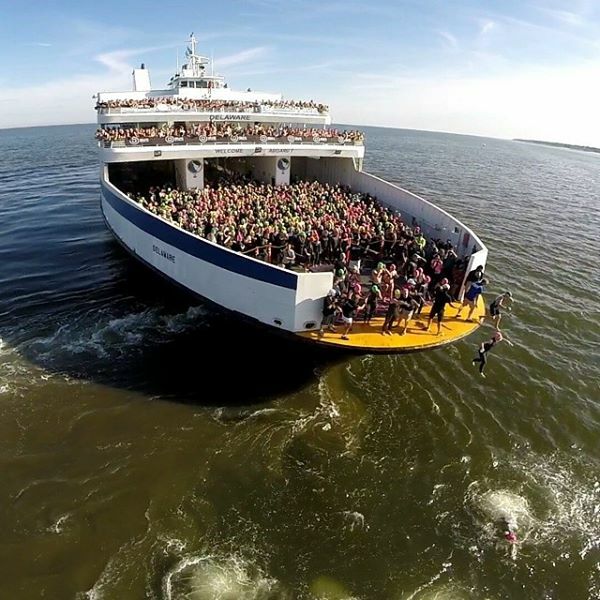 The ferry cruised up the Delaware Bay for about a mile to let its international passengers off first, and then came back closer to shore so the sprinters could disembark. In previous years, the process of getting swimmers off the boat took a long time. I don’t know how Race Director Stephen Del Monte did it, but this year the international yellow caps were off the boat in about 15 minutes. Nice work, Mr. Delmo. When it was the sprinters turn, the Rev, the RD, and I pushed our way toward the front. We met up with Rich Bostwick and Dan Fabrizio and pushed them out of the way as well, because they are boys and we are girls and girls rule. I also wanted to make eye contact with Dr. Mitchell Greene, a sports psychologist who wants me for a patient because he knows he can pay for his daughters’ college tuition, plus graduate school and extravagant weddings with what is going on between my ears. Mitch helps the triathletes who are nervous about the jump. Also, he’s good for reminding me to put my goggles on my face. I tend to stop thinking and breathing as my turn to jump draws near. After my Geronimo moment, WHICH WAS AWESOME, I swam back to shore, rode my bike for a little while and then ran a bit. 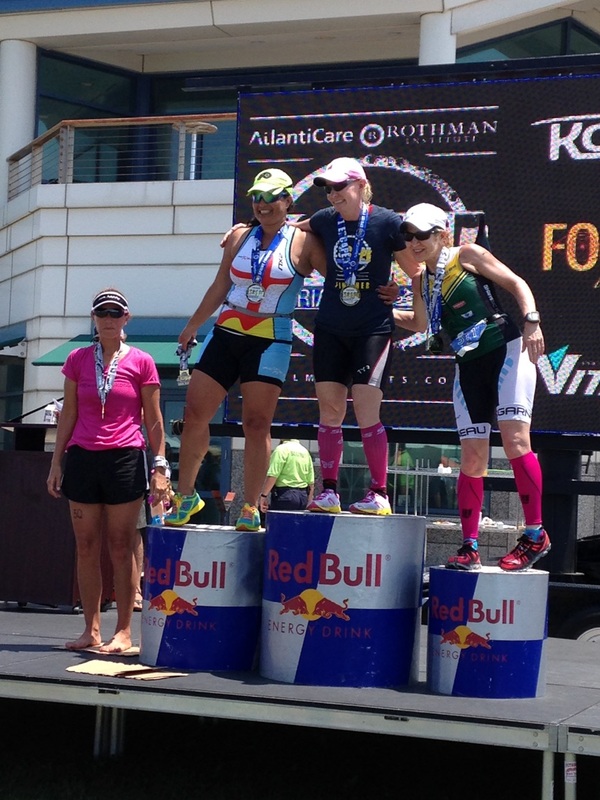 I managed to scrape together a fifth place AG award, which should tell you that all of the fast F45-49 were either in the other race or at Eagleman. Here I am, in a warm embrace with my new friends. I am proudly wearing my 5Q tattoo and 50 Women to Kona T-shirt. My teammates all moved into their summer podium leases. The RD finished third overall and the Rev finished second masters in the sprint. Mrs. Donovan won the international masters with Snarky G. finishing behind her in third. Cape May IPA made for a perfect finish to the first triathlon of the year. 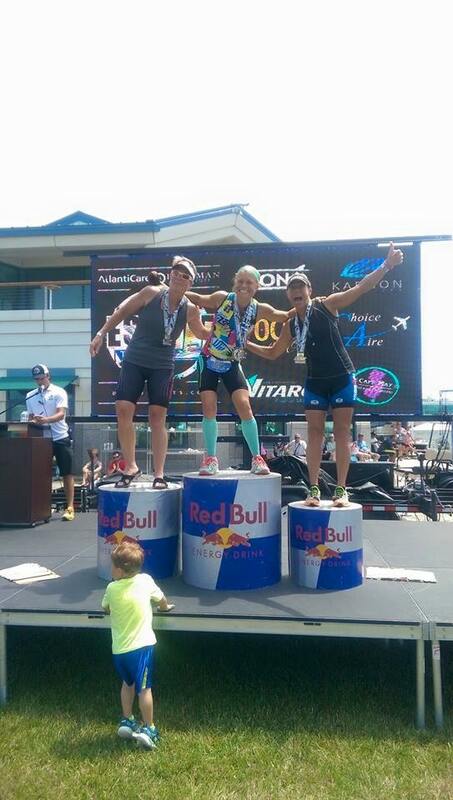 Shout out goes to Rich Bostwick, for photo bombing his son on the podium. That one is going into the TMT Photo Bomber Gallery. Oh, hello little mini photo bomber. You do good work. Jumping off that ferry is the most fun thing I do all year. I want them to put a ladder down the side so I can climb back up and jump again. It’s like the high dive at the community pool. Only the coolest, bravest kids do it.